Hair type: Suitable for very dry hair that is damaged, brittle, lackluster and subject to split ends. A genuine "day cream" for dehydrated hair, Phyto 9 Daily Ultra Nourishing Cream is a combination of Macadamia Nut Oil and Plant Extracts, all carefully selected for their hydrating and nourishing properties. Native to Hawaii and very rich in essential fatty acids, Macadamia Nut Oil has the distinctive feature of resembling sebum and provides intense nourishment without leaving a greasy residue. Soybean, Calendula, Burdock, and Plant Mucilage penetrate the very core of the hair fiber to help restore the keratin moisture levels. Treated from within and protected on the outside, hair rapidly regains its original shine, suppleness, and softness. Directions: Use on towel-dried hair, after shampooing with Phytonectar Shampoo or apply to dry hair. Spread a dot of cream in the palm of your hand and apply all over hair, paying special attention to hair ends. Massage in until fully absorbed, then style hair as usual. Do not rinse. 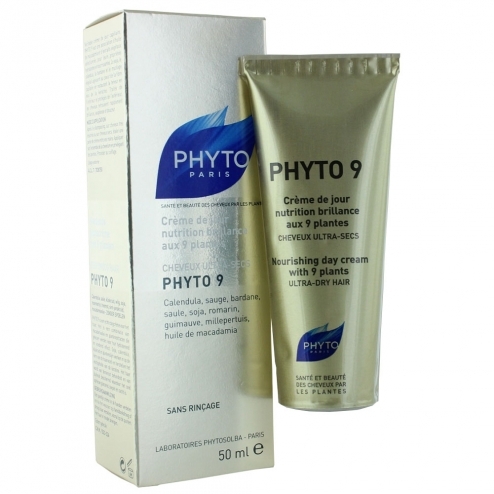 For detangling and softening of longer hair lengths, use Phyto 9 Cream after use of Phytokarite Conditioner. Also helps to remove static. Ingredients: Althea Officinalis Extract, Macadamia Ternifolia Seed Oil, Arctium Majus Root Extract, Rosemary Leaf Extract, Sage Leaf Extract, Calendula Officinalis Flower Extract, Willow Leaf Extract, Hypericum Perforatum Extract, Lecithin, Sodium Dehydroacetate, Propylene Glycol, Phenoxyethanol, Parabens (Butyl, Ethyl).